Mumbai- and San Francisco-based Haptik Inc has raised an undisclosed amount in its Series B funding round and has also formed a partnership with Times Internet Ltd (TIL), the digital business arm of media conglomerate Bennett Coleman and Co Ltd. The funds will be used for product development, business operations and improving artificial intelligence. Going ahead, Haptik intends to invest in artificial intelligence (AI) technology to process requests faster. Kalaari Capital, an existing investor in Haptik, is exiting in the latest round of funding. Haptik helps users get their service-related issues resolved by connecting them with experts from various enterprises. These range from online shopping to travel bookings, food delivery, restaurant reservations and best mobile plan recharges, among others. In order to provide support to customers, it has partnered with firms such as Flipkart, Ola, Via.com, Cleartrip, UrbanClap and DineOut. The firm generates revenues through commissions on transactions. The startup was established in August 2013 by Aakrit Vaish, who is co-founder and CEO, and Swapan Rajdev, who is co-founder and CTO. Prior to founding Haptik, Vaish was heading the India operations of Flurry Inc—a mobile analytics, monetisation and ads firm—which was acquired by Yahoo in July 2014. He also co-founded and headed a real estate platform for college students, which was acquired by CommonFloor in April 2014. 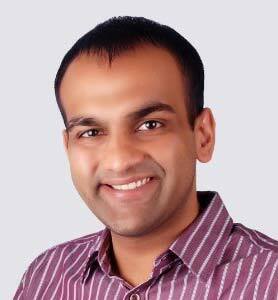 Rajdev was a software engineer at Radius Intelligence Inc, before setting up Haptik. The former Accenture consultant is also founder of Zing! Apps that creates web-based iOS applications. Currently available on Android and iOS platforms, Haptik claims it processes over half a million requests a month. It has a team of more than 300 experts. The firm focuses on scaling its operations using artificial intelligence, as 25 per cent of queries it receives are handled using AI technology. The company raised its first round of funding of $1 million from Kalaari Capital in September 2014. Last month, Times Internet revamped its top management, appointing Satyan Gajwani as managing director, while Gautam Sinha, earlier COO at TIL, was made chief executive officer. Over the past 18-24 months, TIL has stepped up the pace of its acquisitions. With funding slowing down and startup valuations moderating, it is looking to invest in more companies in the near future.